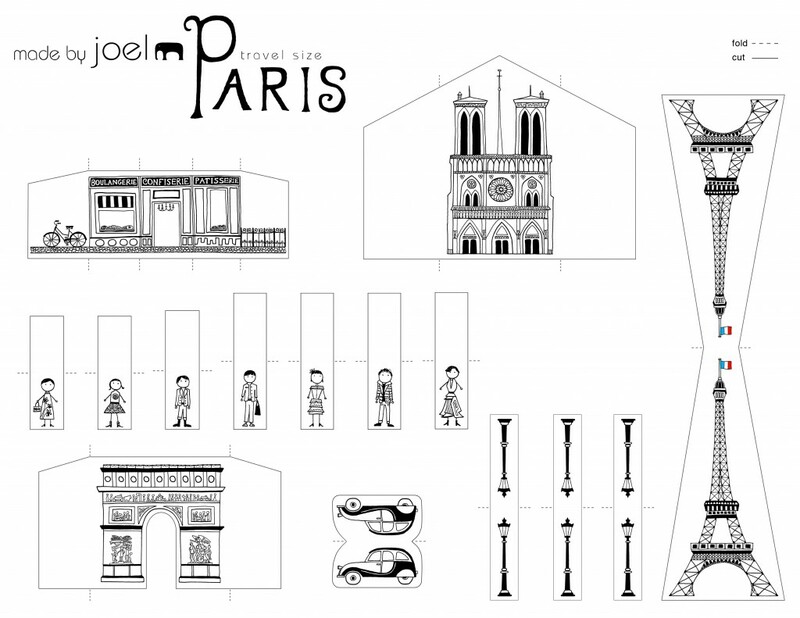 Made by Joel » Travel Size Paper City Paris! It seems like we’re always in the need of more kids activities for restaurants and travel. 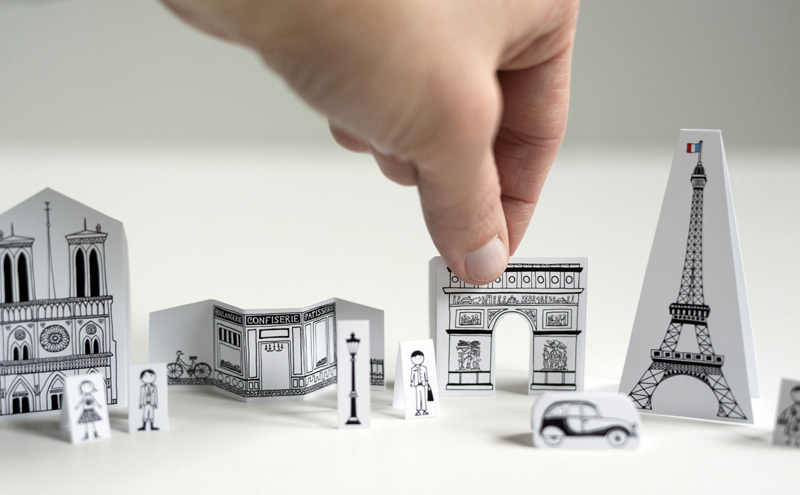 Shortly after I made Paper City Paris, I wondered what a miniature version would look like. Finally, this week I had the time to try it out. It was really fun redesigning and simplifying the folds and structures. 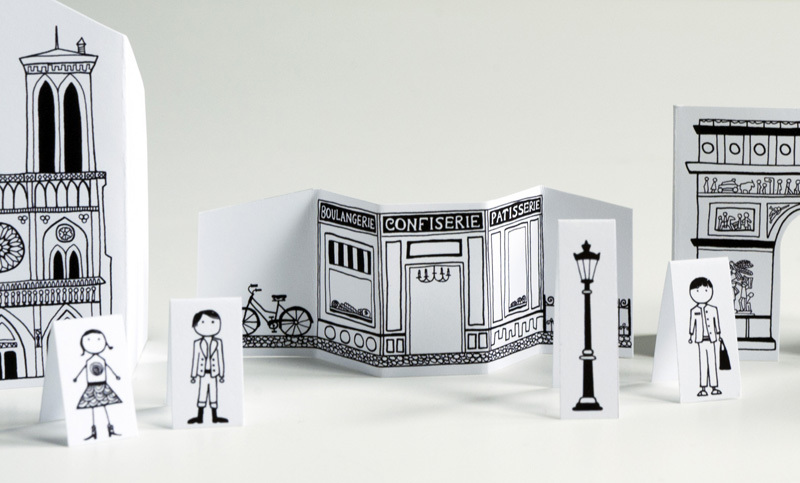 For example, the people in this set are so small that I just made them into single strips of paper that bend in half. It ends up being even easier to make than the original. It’s also quite handy to have the entire set print out on only one sheet of paper. Great for larger groups of crafting kids. 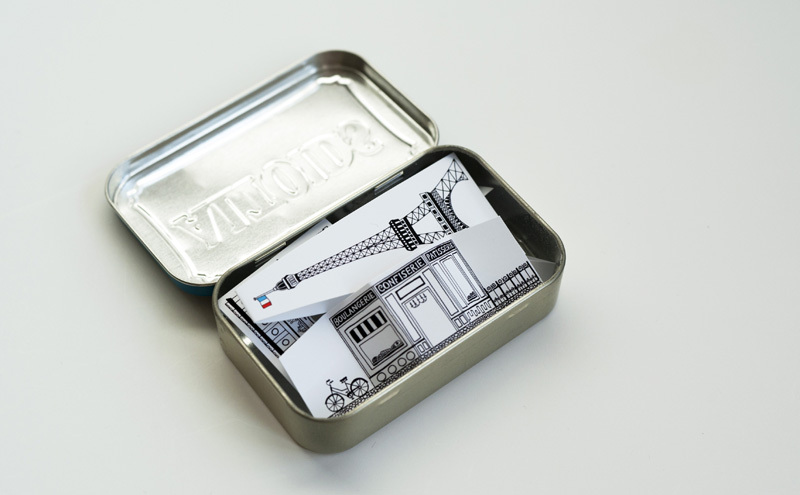 And when you’re all done, you can fit all of Paris into a mint tin, so it can be stowed in a pocket or bag. Happy traveling, and amusez-vous bien! Make another city in travel size please!!!!!! yes!! make another city please!!! Amazing :) We went to Paris for our honeymoon with my husband just a month ago and we have been there again in December. This city is just enchanting. And this toy as well! I love your travel size paper Paris! It's more meaningful given I'm going there in September and I'm really excited. Here are the photos I took : http://qviaje.wordpress.com/2013/07/27/paris-en-papel/ Thanks! My 4 year old son and I loved your little Paris, he is sick today and it made our morning much more enjoyable. Thank you. You're welcome! Hope he gets better soon! My bf has always wanted to go to Australia! It would mean the world if you did Australia for me!! Thank you so much for creating these! I was super stumped on what to do for my niece-in-law who's got pretty much everything. This was the one thing I knew she didn't have, so it's going be a sweet Christmas surprise. Love it! In fact, my mom and I loved it so much that we printed out the paper city and glued it to an old set of colored wooden blocks for my 2 year old little boy. Thank you again! When my mom was sick I made this for her and she loved it. I also made another one for myself because it was so cute! You are an amazing artist. I want to be just like you when I grow up. I will be waiting for more mini sized cities. Thank you so much for sharing your talent with us. Thanks again Hailey. So kind of you to give your mom the little Paris city. I definitely plan on making more! thank you very much for your designs are beautiful. And thank you very much for sharing. Use your design Paris to make a exploding box with scrapbook technique. No like share a photo of my project but if you tell me, I will gladly. Greetings! Thanks Débora! Yes, I would love to see a photo! You can send it to joel@madebyjoel.com. Your project sounds very cool! Ummmm - you're a genius! THANK YOU!!! I will be making this for my 8 year old daughter for Valentines day. She loves Paris from seeing it in movies and books. I know she will love this. What did you put on the on the outside of the tin? I didn't put anything on the outside of the tim, but that's a good idea. I'm sure you could decorate it somehow. Nice! This is fantastic! I can't wait to do this with my grade eight core French class. It's going to be part of a unit on travelling to French-speaking places :-) Thanks so much! That's great! I'm glad you found my site. Have a fun class!! Est-il possiƄle de vous reprendre 2 3 lignes sur un site internet peeso ? Merci, Joel!!! Ma classe l'adore!!! L-o-v-e your travel size Paris paper city (as do many others, obviously)! Thank you for sharing and letting so many benefit from your talent. Israel, pleeeeease! ;). Thank you! !